Puthukkodi Kottuthodi Sankarankutty, the Indian newspaper cartoonist known as Cartoonist Kutty during a long career, died in Madison, Wisconsin on October 22. He was 90 years old. The cartoonist was born in Ottapalam and educated at that city's high school and later at Malabar Christian College. 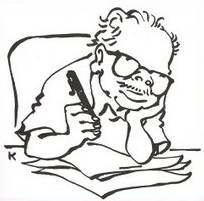 His first published work was for the humor publication Viswaroopam edited by the satirist MR Nair. That work saw publication in 1940. Kutty received training from the cartoonist Kesava Shankara Pillai (Shankar), to whom he was introduced by a relative working in the imperial service. The young cartoonist used the exposure of working with Shankar -- then contributing work to the Hindustan Times -- over a six-month period to join the staff of the Jawaharlal Nehru's English-languge National Herald as a cartoonist. His first work for that publication appeared on January 15, 1941. After a stint at the Herald that ended with that publication's suspension at the hand of the British India Government, Kutty moved to the Madras War Review in Madras from 1943 to 1945 and then the Free Press Journal in Bombay in 1945 to 1946. That year he returned to New Delhi to work for a paper planned by his mentor Shankar, and found freelance work for various publications including National Call and Amar Bharat. Shankar did launch a publication in 1948, a humor magazine rather than an evening newspaper, and Kutty joined that effort's solid cartooning staff. He then found work with the Indian News Chronicle through 1951. In 1951, Kutty joined the Ananda Bazar group operating out of Calcutta. He worked for that group's publications for several decades, initially the English-language Hindustan Standard but also the Bengali-language daily Ananda Bazar Patrika. He was during the 1950s through the 1980s syndicated to publication including the Hindustan Times, the The Indian Express and Aaj Kaal. Although he did not speak the Bengali language, a great deal of his most significant work was done for publications in that language. In recent years, the cartoonist was honored as a doyen of the Indian cartooning scene and of Indian journalism generally, one of the last of the classically-trained and traditional-practice newspaper cartoonists. Kutty moved to the USA to be near family about a decade ago. He stopped cartooning in 2005 due to failing eyesight. Kutty wrote an English-language memoir, Years Of Laughter: Reminiscences Of A Cartoonist, released in 2009. He is survived by a wife, a son, a daughter and two grandchildren.